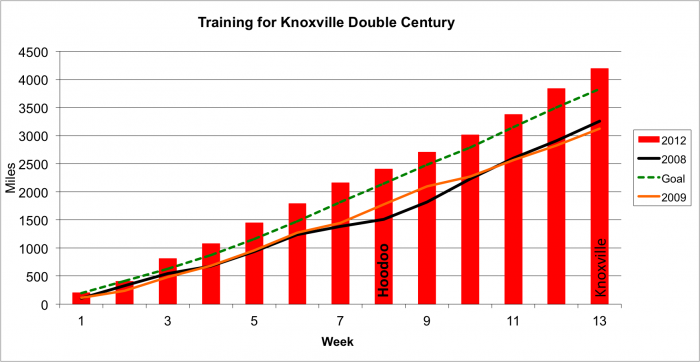 The last time I rode a double century was in 2009 when I did the Death Valley Double and Solvang Double. 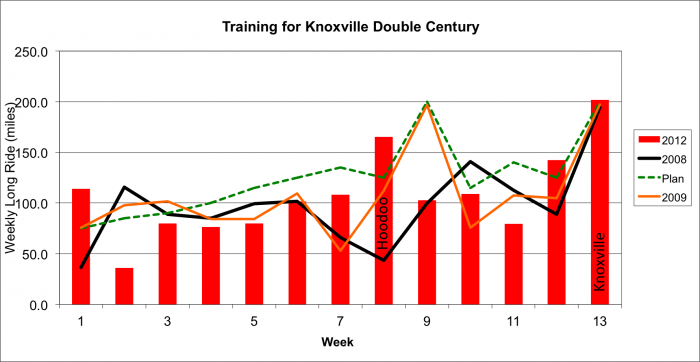 I have never ridden the Knoxville Double before and since I was already mostly trained for it in preparation of racing the Hoodoo 500, I decided to do it. It was not an easy double century, but not the hardest either. About 12 of us gathered for dinner the night before and decided to meet for a 5 am start. Being so late in the year, that meant riding in in the dark for nearly two hours. I decided to not bring my brightest light, figuring the Lezyne. Super Drive light would be sufficient. 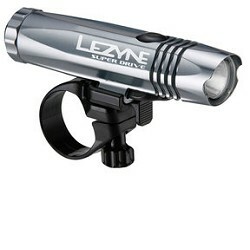 Although my Magic Shine will put out about twice the lumen, it has a much heavier battery and the Lezyne light proved fully adequate. 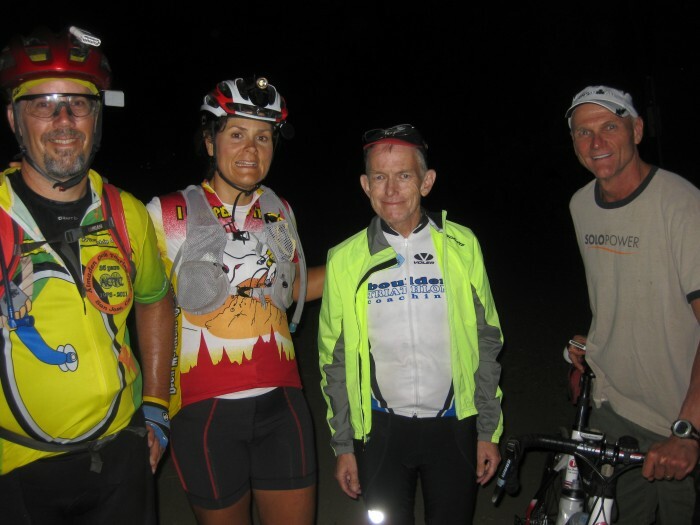 Tom Mac and I decided to try to stick together but I wanted to ride with the rest of the group for awhile so I was rolling out at a moderate pace, but in the dark I kind of lost track of everyone and soon Tom and I found ourselves separated from the rest, so we picked up the pace. We slowly started to catch some other fast riders and they would join us. Some of those would then move to the front of the growing pack and take some long pulls. After going out Pleasant Valley Road, we turned left on Highway 128. It was the most surreal image before us with the large moon just up over the horizon of the hills, illuminating the darkness all around us. It was one of the high points for the entire ride. Then the climbing started and our group of maybe 10 riders started to break apart, so I asked Tom to slow down the pace since others in the group had very bright lights and we could use them for the descent. That proved to be useful. After reaching a flatter section I moved to the front and took a long pull, riding down in the aerobars. When I rotated back to the back, I was surprised that we were down to just 3 riders. We soon picked up a 4th rider, who joined us, but he burned himself out after awhile. At mile 43 we arrived at the 1st rest stop, it was now light. After a short stop, Tom and I headed out and for the rest of the ride it was mostly just the two of us riding together, no more groups to draft with. We continued on Highway 128 all the way to the Silverado Trail but were on it for less than 4 miles before we headed up Howell Mountain Road. I was feeling fine to climb and we passed several riders during the ascent. Then it was onto White Cottage Road, then a left down Howell Mountain Road, then a right turn up Pope Valley Road. I had biked many of these roads on Sierra to the Sea, but sometimes in the opposite direction. Rest Stop #2 came at mile 71, near the top of Lake Berryessa. I had felt my left ankle hurting for the past several miles and when I got off the bike it was hard to walk. I was not sure what was going on, so early into the ride. It hurt more to walk than to ride. I decided to just kind of ignore it for now and hope it did not get worse. After the rest stop we turned left on Knoxville Road, which has to be about the worst pavement in the entire State. It not only had chuck holes everywhere, there was no good asphalt, no matter how you might try to maneuver. You could hear the asphalt crunching under your tires. The poor pavement, coupled with all the rollers made for a long section to get through. I was glad after many miles that the road condition improved. It was then a series of climbs before rest stop #3, where they had lunch. When I got off the bike my left ankle was really hurting now, so I took my shoes off. I decided that what was causing the pain was it pushing against the outside of my left shoe. I had switched to Speedplay Zero pedals so I could reduce the float since my left ankle had a tendency of rotating a lot while pedaling. I had not made any further adjustments in the last month and not experienced this pain, but decided at this point I needed to increase the flow on the cleat. Fuzzy was there and he had a small Phillips screwdriver in his van so I adjusted the left cleat to give me more float. That really helped when I started to ride again and the ankle, although a bit sore was not a big factor. I was hoping to get to mile 118 before 1 pm when the temperature was forecast to reach the 90s. This was the point of the highest elevation and when much of the climbing would be finished. Because I had to take a longer break at the last stop dealing with a sore ankle, we did not quite make it but were close enough. It was really getting warm as we were approaching the summit. I had tried to be diligent all day to stay hydrated and take electrolytes, but near the summit I started to cramp. That was not a good sign because often when that starts, I have to deal with it for the rest of the ride, which proved to be true once again. I had to slow down the climbing to keep from cramping and for the rest of the ride I could not climb as fast as I normally would have. 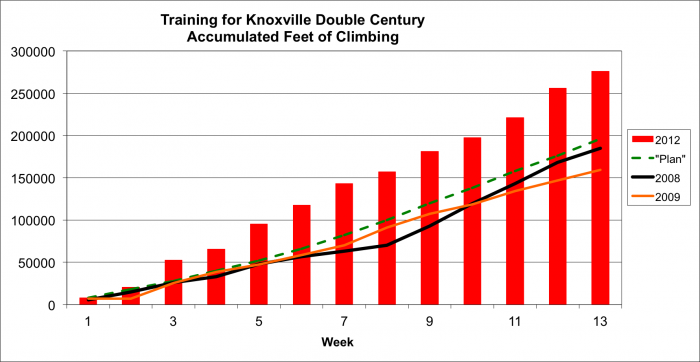 I was glad that 80% of the climbing was finished before first cramping. At rest stop #4, at mile 135, we stopped a bit long where I tried to hydrate more. My Garmin was showing 109 degree temperature, although it tends to overstate things. I was going completely through my two water bottles between each rest stop/water stop so I figured I needed to drink more while stopped. That really helped. Then we went on Butts Canyon Road and Pope Valley Road back down to Highway 128 for Rest Stop #5, which was the same location as Rest Stop #1 was. We were now 160 miles finished and I was feeling very good. My Garmin 800 was starting to run low so I plugged in the external charger I had brought along . I think we lost about 30 minutes due to my cramping, but we were still making good time. We were now retracing the route we had taken out in the morning. 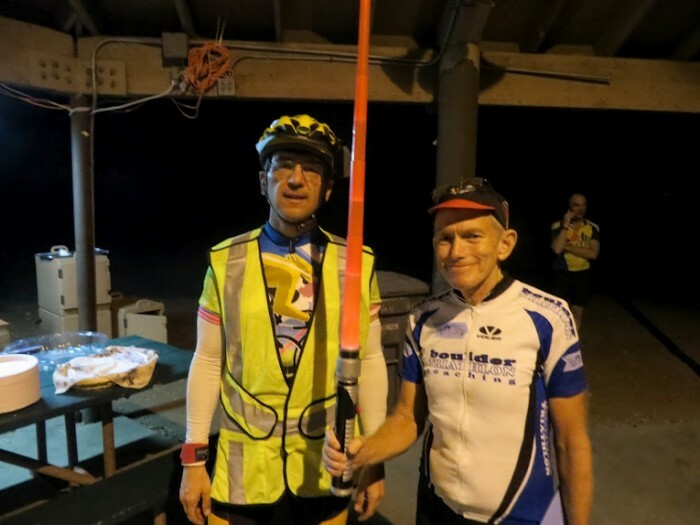 We made it to the last rest stop, at mile 188 before dark. Even though the day was getting late it was still warm so we needed to stop there to get water plus it was staffed by ACTC club members so we wanted to thank them. The last 13 miles back was a fast pace because we had only rollers to deal with. It was about 5 miles from the finish before I finally turned on my headlight. Tom and I rode together the entire route and he was kind enough to slow down a bit when I was cramping, but I was able to still do quite a bit of the pulling. We averaged 15.8 mph, which I was happy with considering we climbed over 13,000 feet. It was great to be finished and enjoy a great dinner. 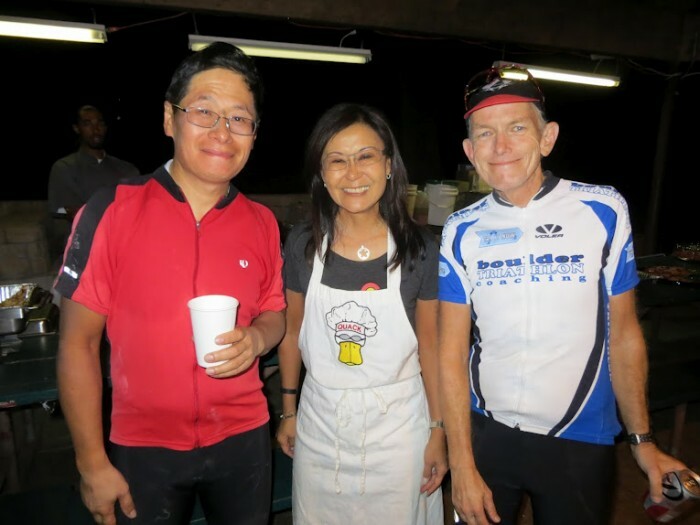 The Quack Cyclists volunteers did a wonder job for this double century. Tom was driving home so he left, but I hung around waiting for the other riders to come in. First to arrive was John Long, who we missed at the start. Virginia’s husband, Ed, came over to the finish to wait for her. He received a text message that she was at the last rest stop so I was able to give him a good idea of how long before they arrived.. She finished with Chris Larson. Later Lane Parker and Teresa Beck arrived and Brian Chun took their photo. It went from too cool in the morning to blistering hot. The forecast was for 100 degrees and I think it got close to that. My Garmin 800 tends to read high on temperature since it is in the direct sun but it reached near 110. You can see from the graph below it did not cool off too much and even when we finished, just at dark, it was still warm. My training plan paid off. 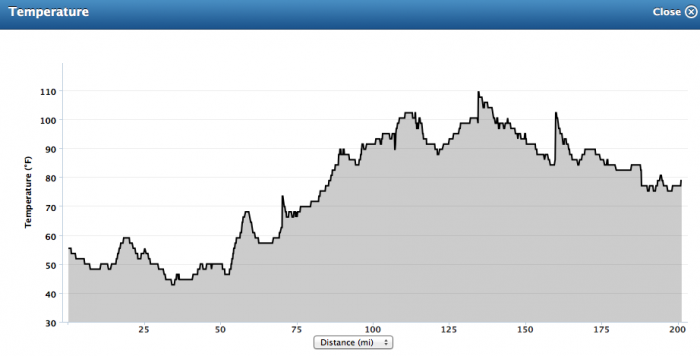 This is what things looked like at the end, including the double century ride.